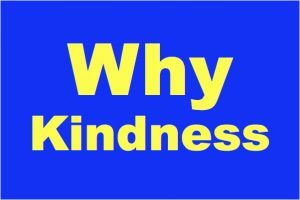 Why Kindness? What Are the Benefits of Kindness? Or more specifically, why would you want to be kind? Actually, kindness is practical and smart. Kindness is a reward in itself. So when you act with kindness, you know that you behaved well. In contrast, meanness leaves a person feeling dirty. Kindness builds positive relationships. It creates alliances. And it leads to friendships. So you feel safer when you act with kindness. In contrast, meanness leads to fears of retaliation. Kindness is essential for making a society (or relationship) successful. For example, people are more effective when they live and work as a team. And effective teamwork is based on each member helping the others achieve success. So showing kindness helps you feel like an active participant in a functioning society. In contrast, meanness degrades a society (or ruins a relationship). People like being with those who act with kindness. This matters in both business and personal relationships. In addition, consistent kindness builds trust. And trust is essential for agreements that lead to assistance, cooperation, promotions, progress, and sales. In contrast, people avoid those who are mean. People who are kind can devote more time to building achievements, implementing solutions, and making progress. They also gain more support from others because everyone prefers to work with (and help) those who behave well. So they succeed through cooperative partnerships. In contrast, people who act with meanness waste time on repairs and damage control. And they often work harder without support. Kindness must work both ways. So you begin by treating everyone with kindness. If the other person responds with kindness, the relationship continues. And if the other person responds with meanness (such as anger, insults, or violence), the relationship needs to move on. Recognize that meanness can push you into either: 1) Attempting to protect yourself, or 2) Retaliating. Unfortunately, both of these responses are forms of meanness. Then you end up in a cycle of meanness. Thus, it is important to avoid dysfunctional relationships before they harm you. Yes, make a sincere attempt to resolve them, because one act of meanness may have been a mistake or a misunderstanding. If the meanness continues, then ask yourself whether the relationship is worth the pain. And the kindest way to leave is: Just go. Because meanness has no compassion for you. It will even justify itself by blaming you. And so just leave without trying to explain or settle or teach anything.